Yes I know I’ve been MIA but there’s plenty of reason! Night school, work and metal music events, have taken over. To make up for my absence, I thought I’d compile a list of upcoming metal related events. There’s the very cool EMP Pop Conference taking place next week from April 14-16 in Seattle. I’ve been wonderfully invited to speak as part of a roundtable called, Noise Breeding Silence- Heavy Metal Voices along with my colleagues, Laina Dawes, Jeremy Wallach, Ester Clinton, Kat Katz and Steve Waksman. Steve is actually the moderator, so you know it’s going to be a great talk! For those of you who don’t know his work – Steve is a professor at Smith College in Massachusetts and wrote the seminal books – Instruments of Desire: The Electric Guitar and the Shaping of Musical Experience and Ain’t the Summer of Love: Conflict and Crossover in Heavy Metal and Punk. Also taking place next week for NYC locals is the traveling Grimposium – a touring festival that brings musicians, journalists and academics together to showcase and foster discussion on all things metal, coordinated by Vivek Venkatash, professor and metal scholar at Concordia University. This latest event is called, The Sign of An Open Eye: Grimposium 360 and will be taking place on April 14th in Brooklyn at MINY Media Center by IFP. Register here. On April 30th, we also have Women CLAP BACK in Music and the Arts at The New School taking place from 10am-5pm. Several women involved in the local metal scene here in NY will be there, like the wonderful Laina Dawes! I’ll be helping with moderating the panel called, Navigating Race and Feminism in the Music Industry. And of course I’ve got to plug this – I’ll be co-moderating an evening talk on Women in Rock and Metal Music at Barnard College the evening of May 4th, 2016 (registration and info page COMING Soon). Below is a description of the event – ALL ARE WELCOME! Wednesday, May 4th, 2016, 7 PM – 9:30 PM @ Barnard College – Julius S. Held Lecture Hall. Women have had an increasingly steady presence as performers, fans and supporters of rock and heavy metal music, although previous studies have emphasized these spaces as predominantly masculine and white. In the 21st century, women still face challenges in participating and negotiating this historical gendering of space. While New York City is quite often perceived as a product of its own bubble of exceptionalism; race, sexism, and authenticity remain problematic areas of discourse for many women who take part in these musical scenes. An evening with Women in Rock & Metal Music seeks to address these issues, exploring how women of varying ethnic backgrounds, gender identities and sexuality, so often marginalized, navigate their participation and construct spaces of liminality through their art, musicianship and voice. Please join us for a lively discussion and exploration of gender, race, violence, and acceptance in the NY rock and metal scene with panel speakers – Mindy Abovitz (Tom Tom Magazine Creator/Editor), Kristen Korvette (Creator of the feminist site -Slutist ), Laina Dawes (Author of What Are You Doing Here? A Black Woman’s Life and Liberation in Heavy Metal), Justina Villanueva (Heavy Metal photographer and artist) and Cristy Roads (Punk Musician, Zinester and Artist). In addition to these US-based happenings – there are other, just as amazing, conferences coming up – especially abroad. 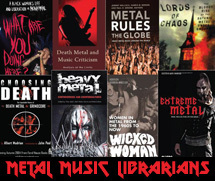 There’s the Bournemouth University Metal Conference on Metal and Politics, being held in the UK on June 3rd as well as the Modern Heavy Metal Conference in Helsinki, Finland – June 30 through July 3rd. You can register for MHM here. Also in the UK, is the Dark Leisure and Music Symposium taking place at Leeds Beckett University on September 16, 2016. There’s still time for submission as the deadline is May 15th. Back in the US, we got the Metal in Strange Places conference taking place in the Fall at the University of Dayton on October 21st – 23rd! If you remember from my previous blog posts, I presented my thesis work on Women in NY’s EMM scene at the 2014 conference in Dayton where I met some of the most awesome people in metal academia. Proposals for Metal in Strange Places are due by April 22nd.This year’s keynote speakers are Gabby Riches, whose book Caught in a Mosh is a great resource that I’ve referenced in my own work and Tracy Reilly who will be talking about intellectual property and entertainment.